Aside from flossing, the most exciting thing that's happened around here recently is a new addition to the Diederich household. Meet Hubert Pumpernickel Diederich, a 5-month-old black and gray Tabby adopted last month from the Peninsula Humane Society. Hugh's namesake was my beloved Tamagotchi, who died tragically in the summer of 1997. He was only 18 days old. Follow this sad link to read about his life -- and death. Hugh is a wonderful cat. Noriko and I had been staid dog lovers but Hugh changed that the second we laid eyes on him. Because we both work crazy hours, getting a dog was out of the question. Like Noriko, dogs are high maintenance. 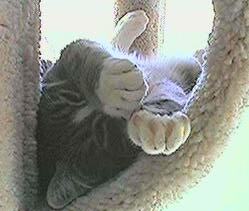 Cats, on the other hand, are independent and can pretty much look after themselves. This is not to say that Hugh isn't being spoiled. Like the original Hugh, our kitty is living the good life: plenty of toys, good food -- even an expensive "California Kat Condo" -- a luxuriously carpeted, multi-level cat jungle gym. Hugh deserves it. He's good-natured and never scratches or bites even while playing. Our kitten does have one weakness, though. After the alarms rings and Noriko and I fall back asleep, he'll creep into our bed and slowly make his way toward my (never Noriko's) defenseless eyelashes and earlobes. He licks and nibbles until I'm wide-awake -- and I don't wake easily. It seems we have a famous lawman in our midst. 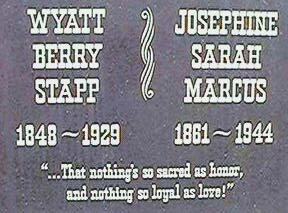 Just a few miles down the road from our happy home lies the final resting place of Wyatt Earp. Yep, the famed lawman who, along with brothers Virgil and Morgan, shot down the hated Ike Clanton gang at the O.K. Corral on Oct. 26, 1881. Wyatt Berry Stapp Earp died in Los Angeles in 1929 at the ripe old age of 81. He's buried in a Colma City cemetery alongside his wife, Josephine Sarah Marcus. She died in 1944. It's interesting to note that Earp's final resting-place, Hills of Eternity, is a Jewish cemetery. He might have been Jewish, but I don't think so. It looks like the plot belonged to Josephine's family, though, since the grave is surrounded by tombstones bearing the Marcus name. On a more personal note, I'm happy to report that my ulcer problem has been solved. It seems that nasty bacteria were to blame and that a strong regiment of antibiotics killed the bad little bugs. So now it's OK to hit Taco Bell anytime the urge takes me there (about once a week). In case some of you are just tuning in, I had a bleeding ulcer that erupted suddenly last October that nearly killed me. I have O-negative blood and it seems that only one out of every 200,000 Japanese have that type. I have a new affliction to contend with, however. A "floater" has set up shop on my right eye. When it first appeared, last June, I thought it was a little spec of something. After a few days of watching this thing float around, I went to an eye doctor who told me the grim news. "You have a 'floater,'" the doctor said matter-of-factly. "I see. So, how do I get rid of it?" I asked. "You can't. It's basically a little piece of protein that has managed to work itself loose from the optic something-or-other." (The doctor didn't actually say "optic something-or-other: I just can't remember what he said.) "It usually appears in people a lot older than you. You said you're 32?" "Yes, yes, I'm 32. But what do you mean there's no way of fixing this?" I said. "Are you telling me I have to spend the rest of my life looking at this, this, this THING? It's HUGE from, from where I see it, at least. It takes up a full two inches of viewing area, for crying out loud." The doctor just smiled. "Don't worry, you'll get used to it. Sometimes the floaters settle down and never bother you." My floater has yet to settle down. It roams around the surface of my eye like a miniature Lewis and Clark expedition. I have yet to "get used to it." Disconnect your vehicle's turn-signal indicator. Californians prefer to surprise one another with random stops and turns, especially in heavy traffic. When someone attempts to cross into your lane, speed up and cut them off. They expect and appreciate this gesture, for it makes them feel as if they've accomplished something when the do succeed in changing lanes. When you feel the need for speed, make sure you're in the lane at the far right so you can cause a cool wreck and delay traffic for several hours during rush hour. To punish drivers who wish to observe the posted speed limit, get right up on their bumper and stay there. That'll teach those slow-driving jerks! Use your cell phone, drink coffee, etc., while driving. Hugh surveys his new surroundings. Hugh awakes from a catnap. 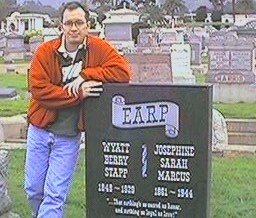 Tom pays his respects to Wyatt Earp. 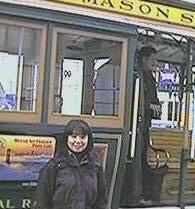 SAN FRANCISCO -- I'm no Brad Pitt and it sure wasn't Tibet, but I'm a changed man nevertheless after seven years in Tokyo. I returned to the U.S. in March for a position at Computerworld, "the world's technology newspaper." The job is great and it's nice to be on the reporting side of the business again after a few years at the copydesk. However, the transition from life in Japan to life in the States was not as easy as I had thought it would be. Japan made me soft, spoiled even. After seven years of living in a city where everything is clean, efficient and safe, moving back here was a slap in the face. There was a period of decompression, "reverse culture shock," some call it, for the first couple of months. Nevertheless, I suppose it was much more intense for Noriko. She seems to be doing fine, though. It took her just two months to land a job downtown at a major bank and she seems to have adjusted well to life here. The weeks are flying by but it feels like years since I left Japan. Seven months, is that all it's been? Weird. We've moved three times. We bought a tiny condominium. 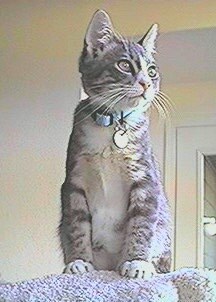 I gained weight -- 5 pounds so far and counting. We adopted a kitty. Copyright © 1998 The Diederich Journal Inc.